I have finished Gwragedd Annwn’s 2017 Refit and Refurbishment. 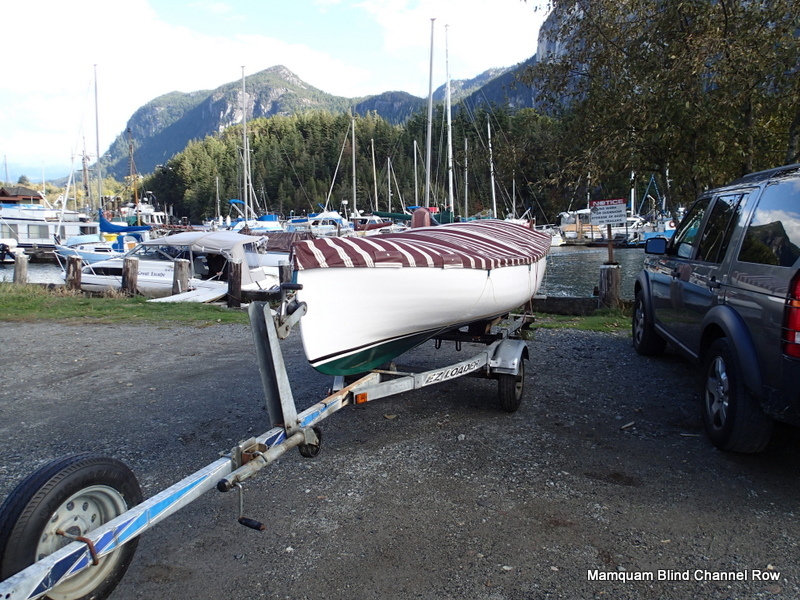 Time to take her out for a test row… She has new adjustable thwarts, air tight foredeck, stern and side buoyancy tanks, new foot braces and a new foredeck storage box for her anchor and lines. 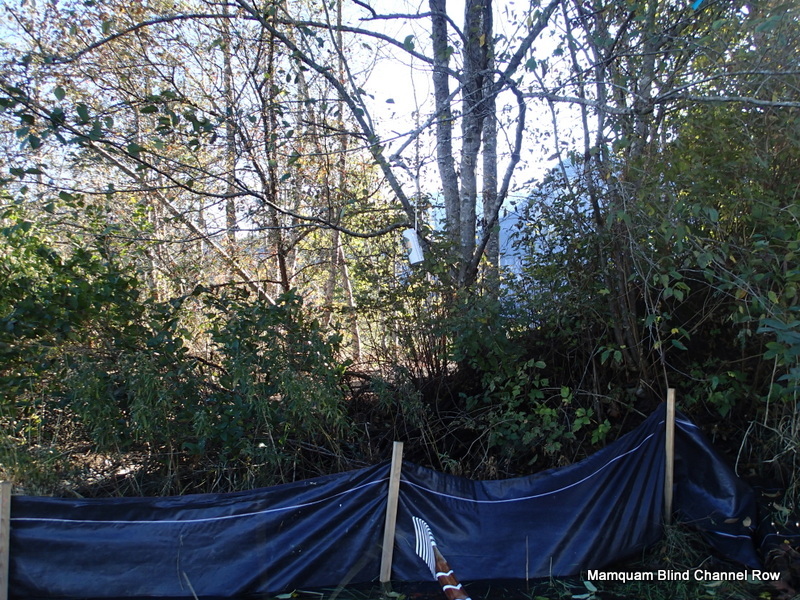 One of the things that you have to look out for in Squamish are the inflow and outflow winds. In the summer, they usually outflow until 11am, they then shift and become inflow and are usually very strong. 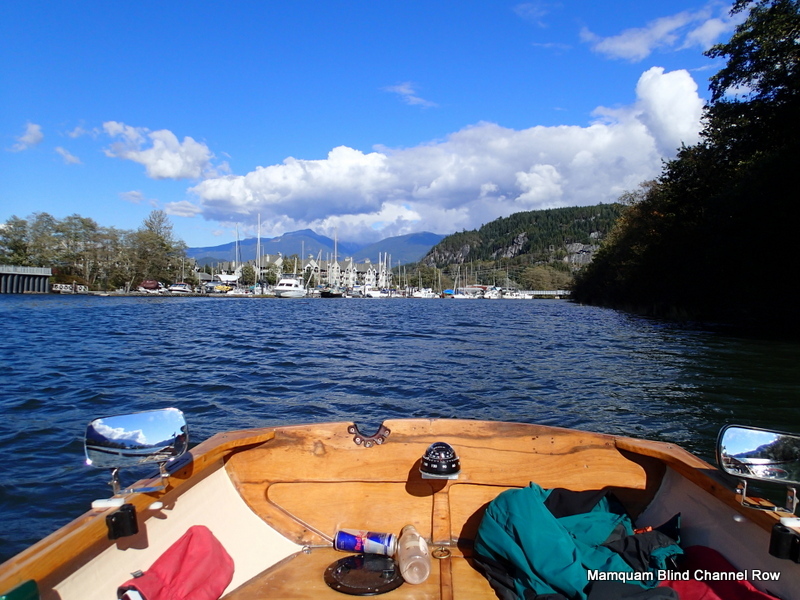 The weather prediction for today is for light to variable winds. I unpack Gwragedd Annwn, stow her traveling cover and stow my gear. 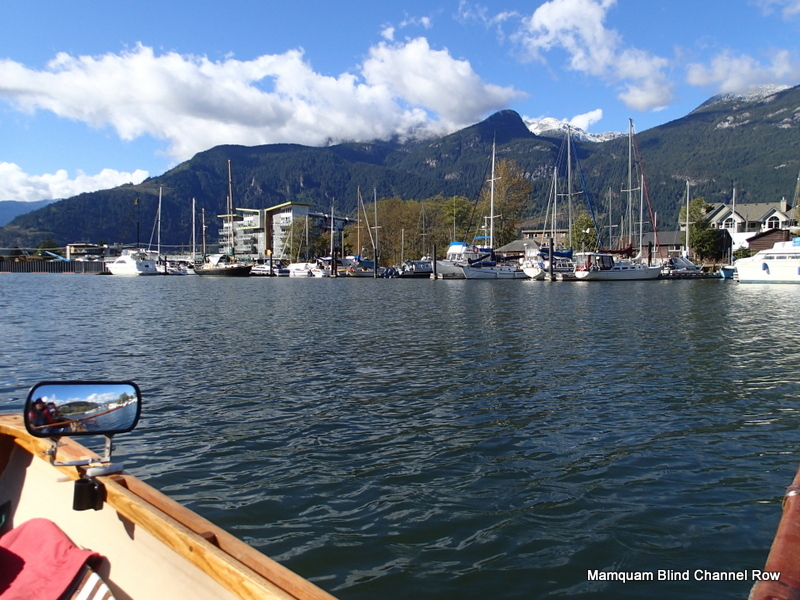 Arriving at the free boat launch, next to the Squamish Yacht Club. 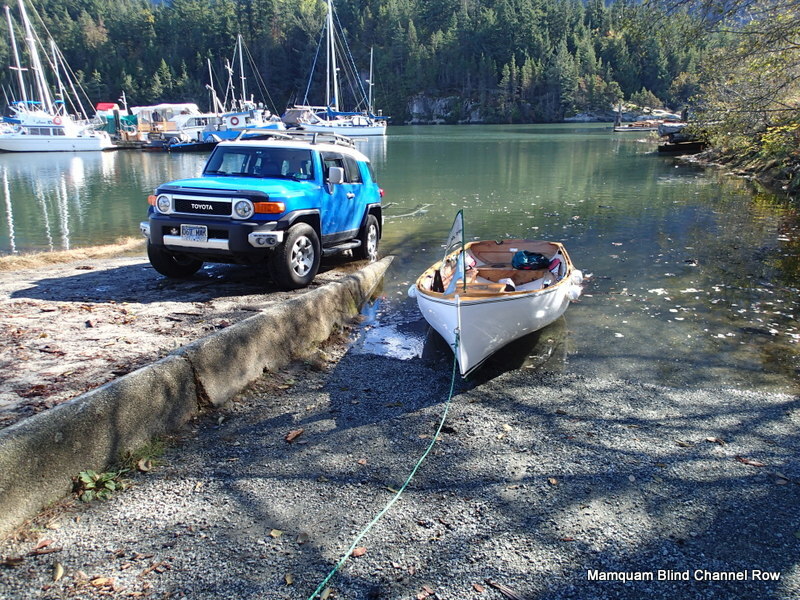 The boat launch is basic and very usable. It is best at a mid to high tide. 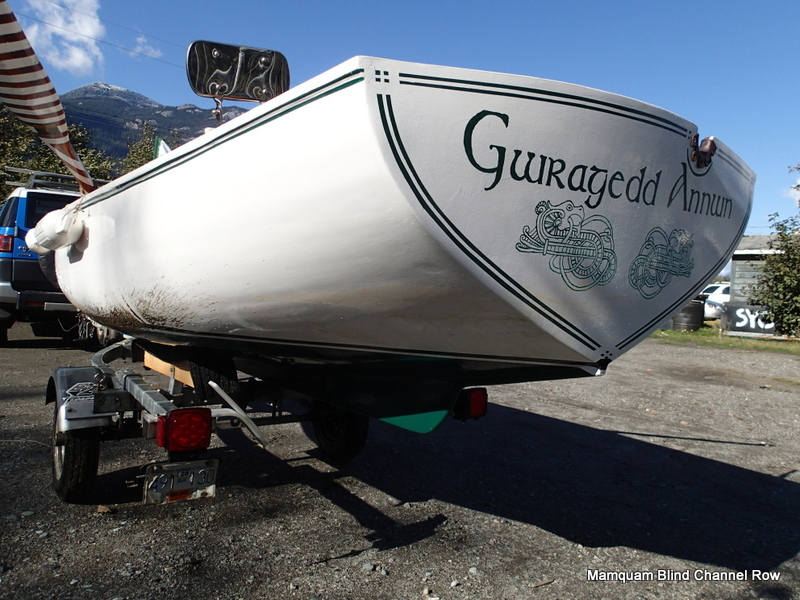 Gwragedd Annwn at the boat launch. There are actually two lanes, one paved (Port) and one gravel (Starboard) where Gwragedd Annwn is beached. Truck & trailer parked, Gwragedd Annwn ready to go. 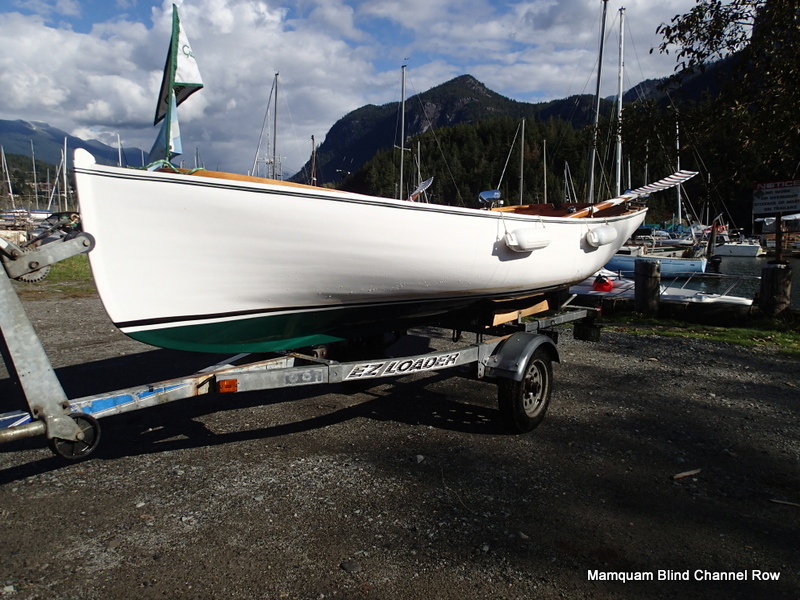 In this photo you can see her new foredeck storage box. I reused the blue seat cushions. 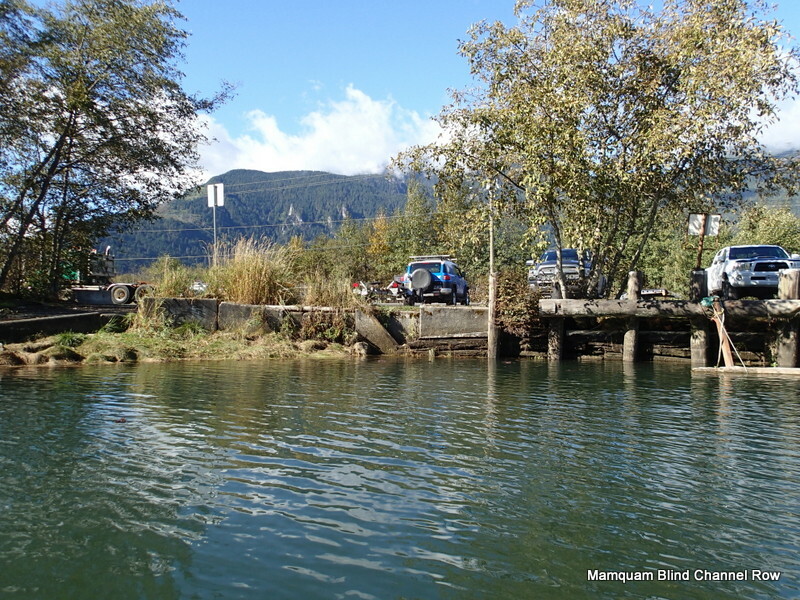 Leaving the boat launch behind. 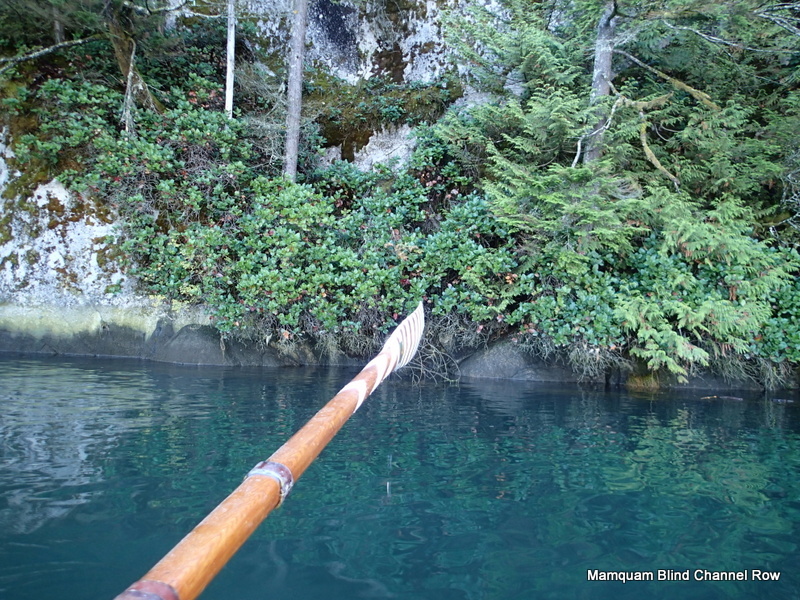 I row out into the Mamquam Blind Channel. 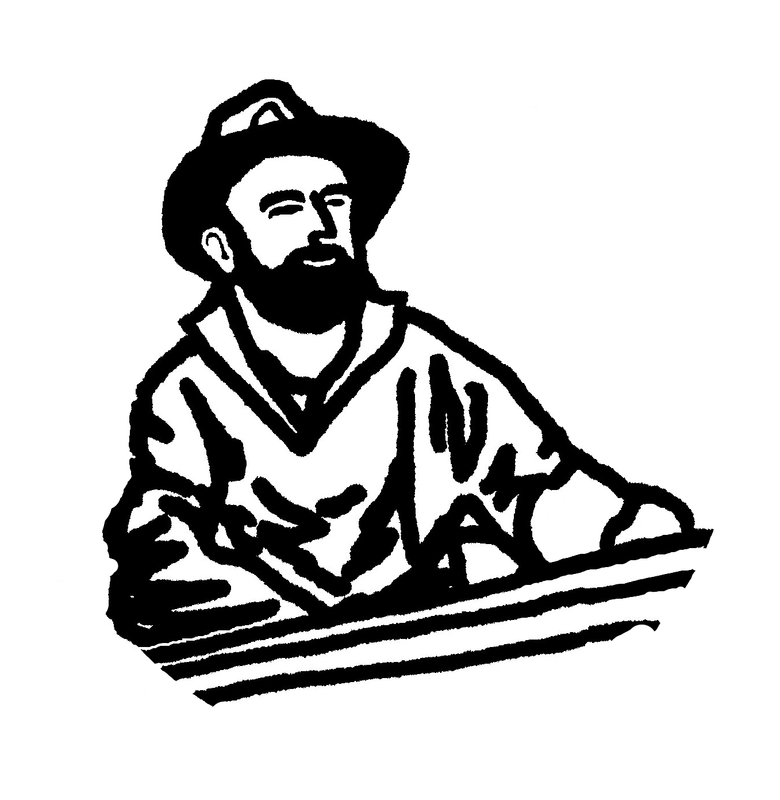 I row across the channel and head North-East, up the East side. 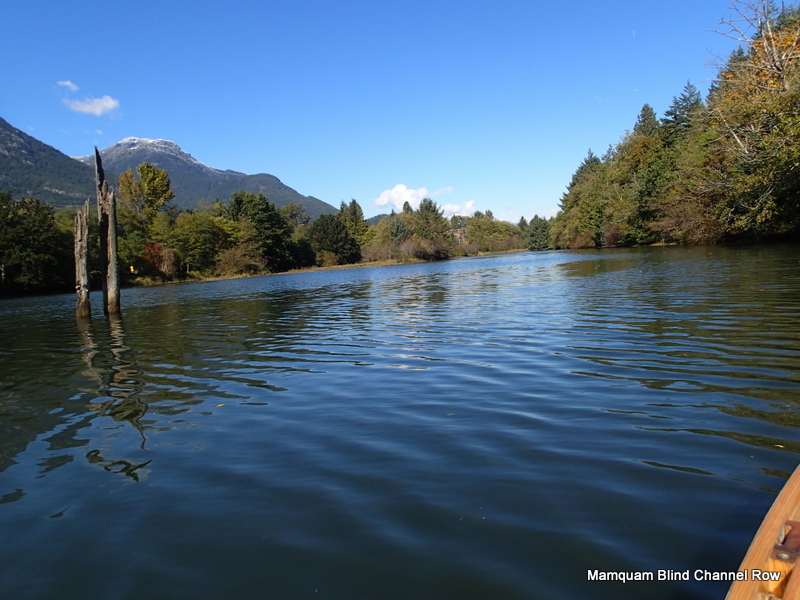 The East shore is undeveloped across from the boat launch. 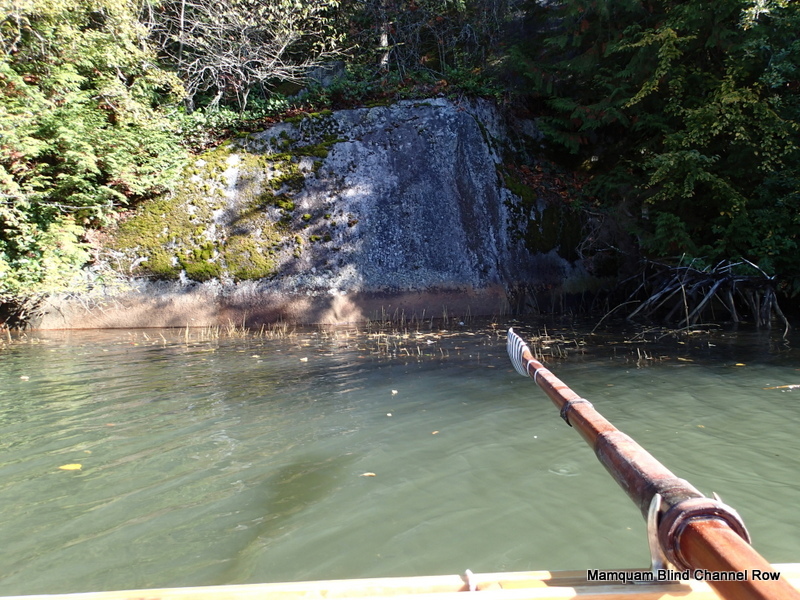 I row around a little cove, exploring the shore. I continue up channel. 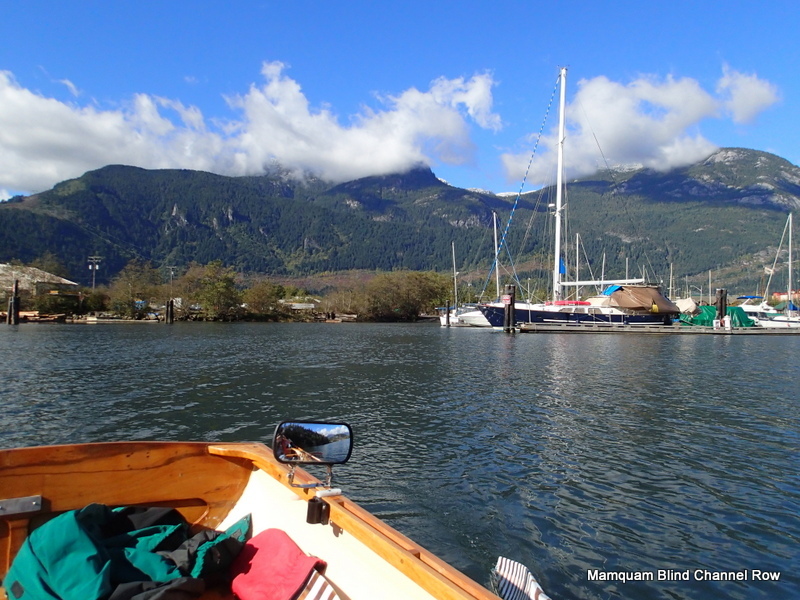 Squamish side of the channel. 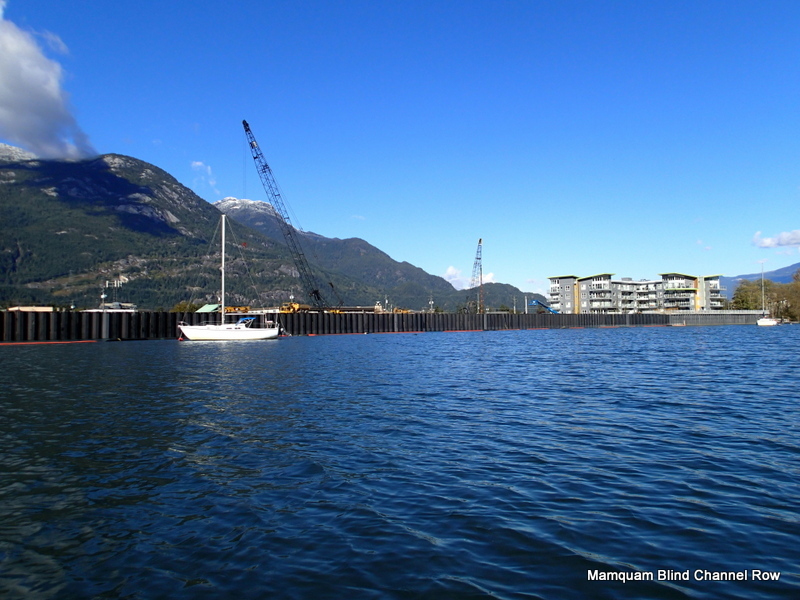 They are pile-driving on the West shore for some waterside housing/multi-use development. Blue Heron Marina on the West Shore. 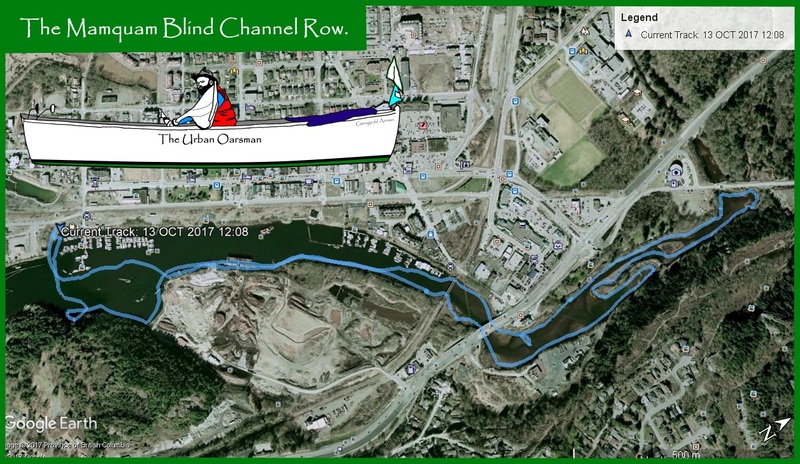 I keep rowing up channel on the East side. A can of FAXE beer hung as a “Scare-beer”??? 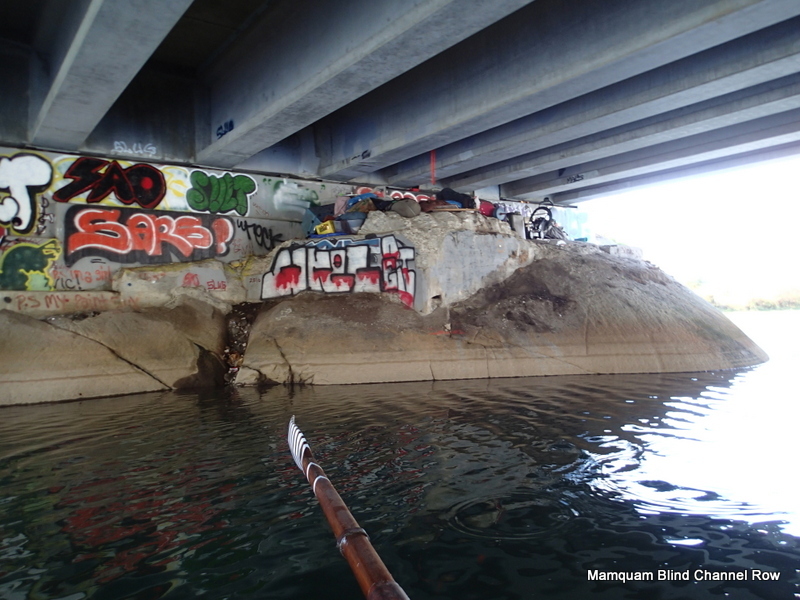 There is a camp under the Highway 99 overpass. Camp under the overpass. South end. 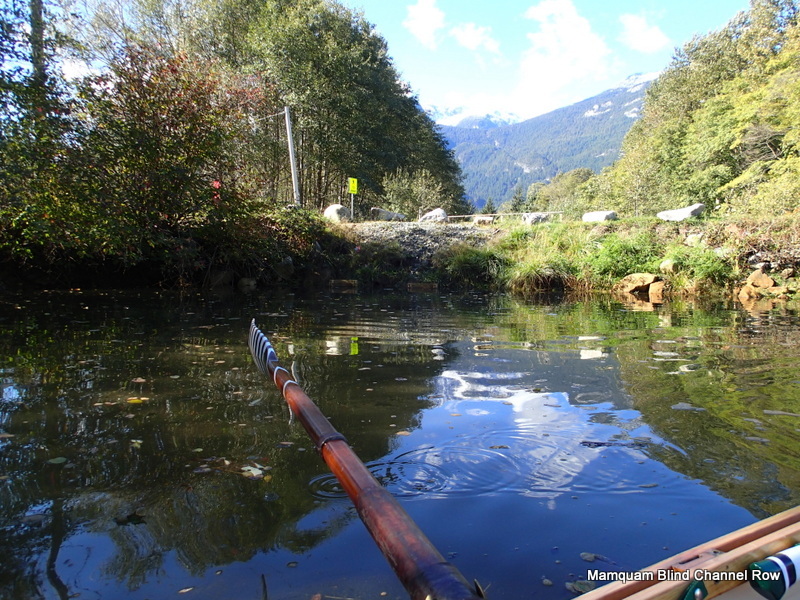 I continue rowing up channel. 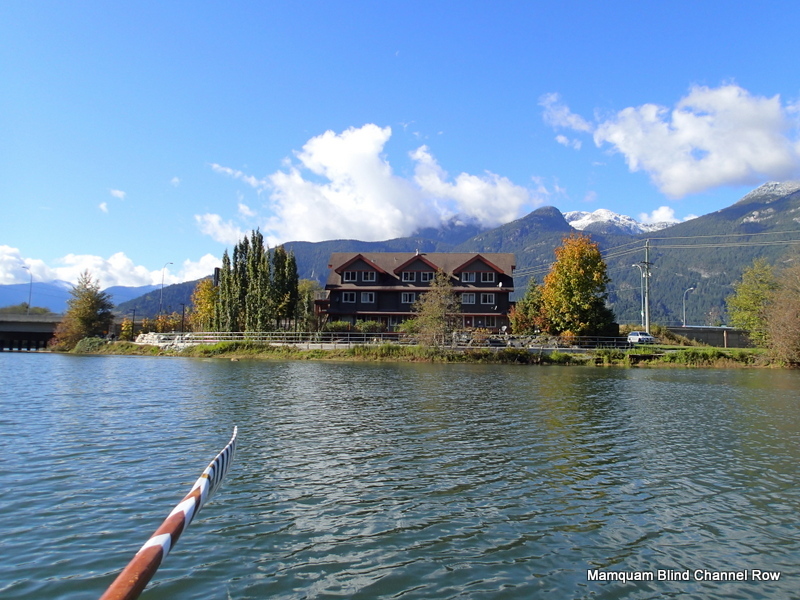 Squamish Adventure Inn & Hostel. The Inn/Hostel has a foot path between it and the shore. 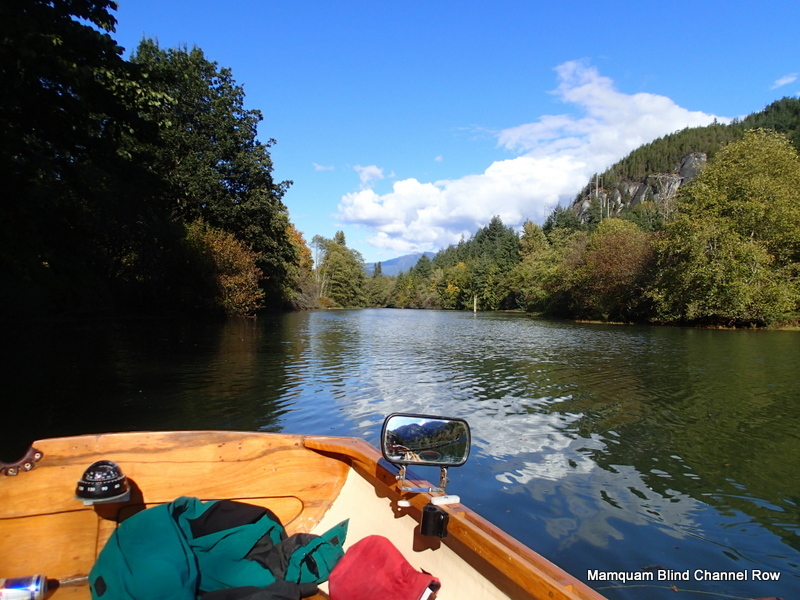 Mamquam Blind Channel Row, Squamish, BC. 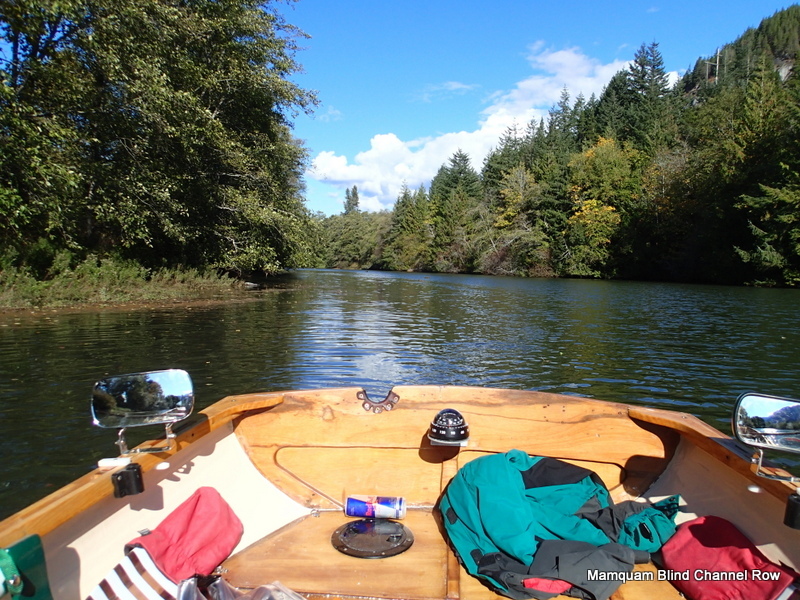 I row past the Inn/Hostel and the channel becomes more “wild”. 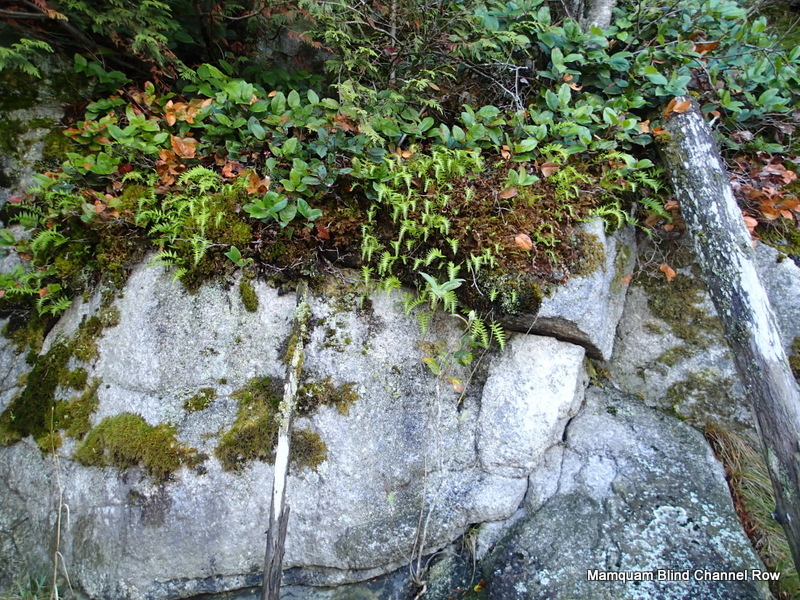 Mossy rock on the East shore. I am getting up to the top of the channel. Pedestrian bridge, NE corner, head of the channel. It is really neat, made from an old railway flatdeck car. Pathway bridge over small creek. I could not find out what the creek was named. 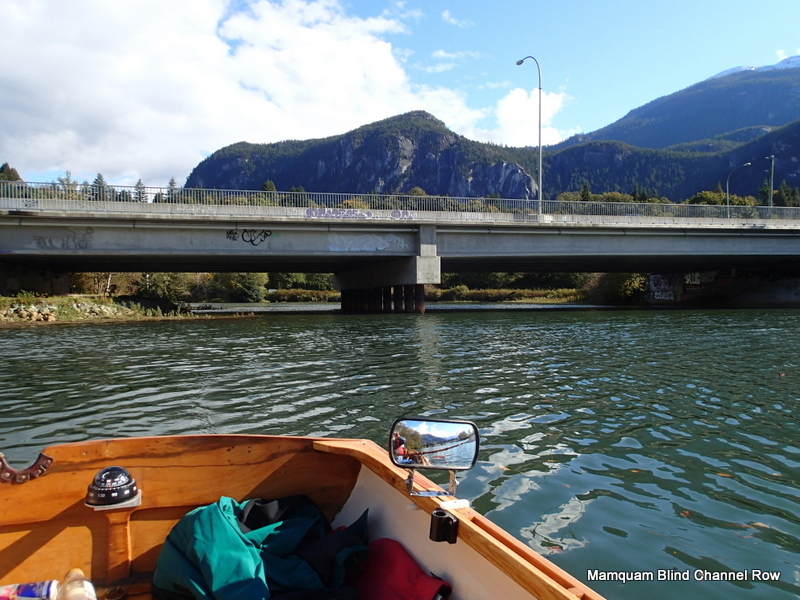 The drainage pipes lead to a channel that goes to the West and can be seen from the Sea-to-Sky Highway. Gwragedd Annwn cannot go any further upstream. I eat my lunch and begin my return. I am heading back into a bit of an up-channel breeze. 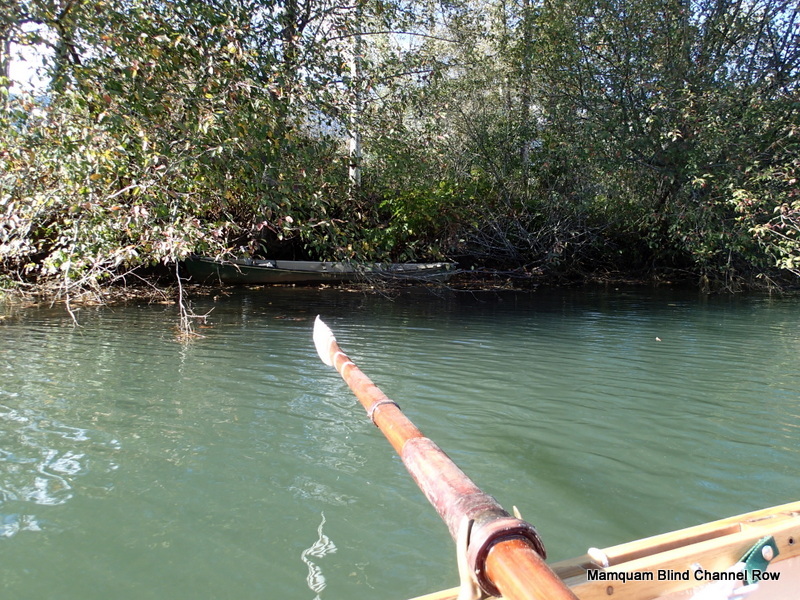 By sticking near the bank, I stay out of most of the wind. 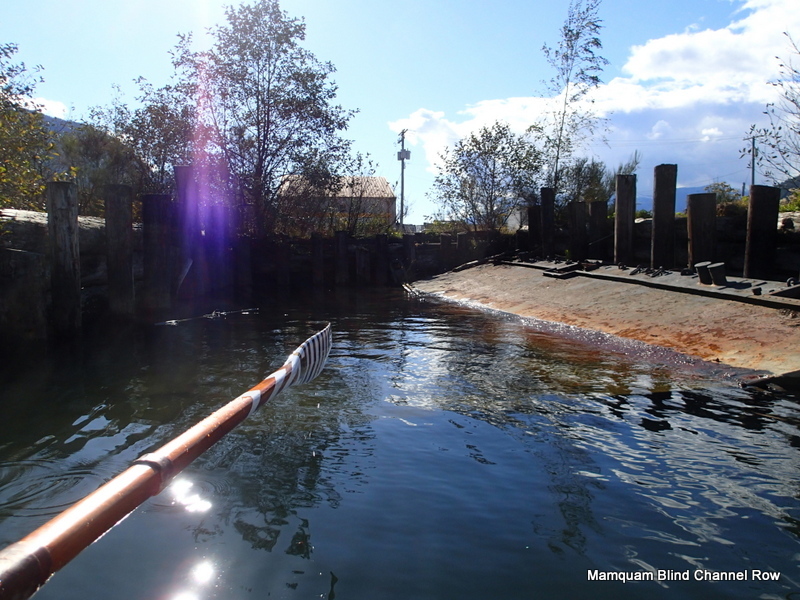 You can see the RedBull can I picked up out of the Channel. 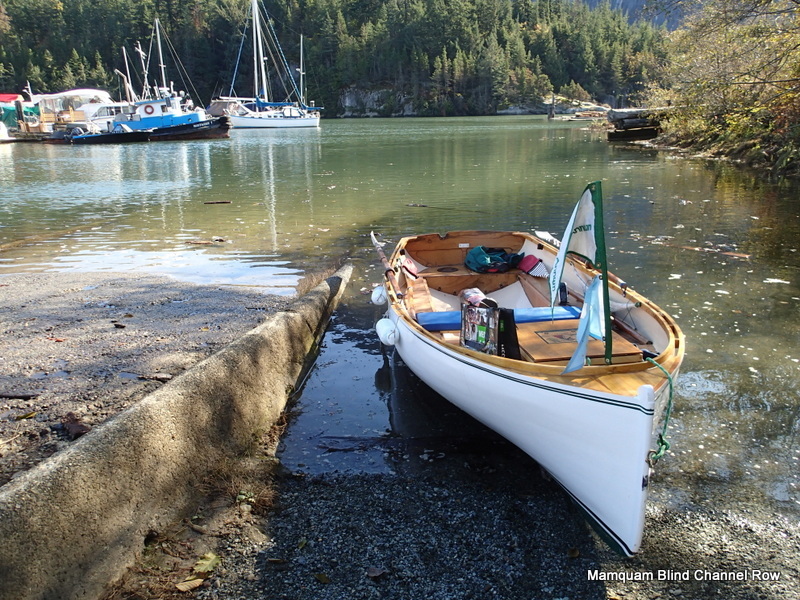 A canoe ready for an adventure.?. 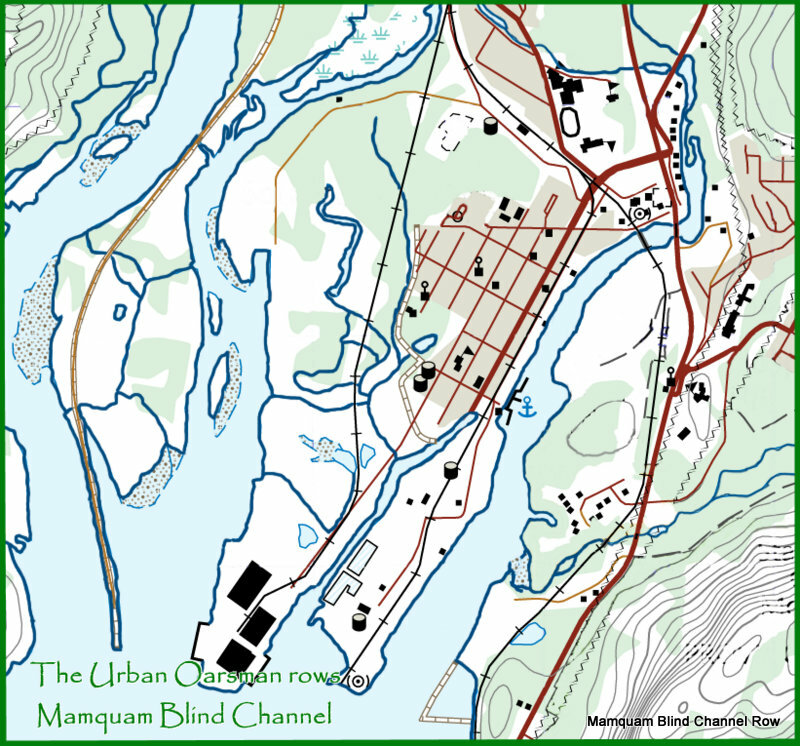 I had planned to row back along the West bank, but, with the wind, the rowing is easier along the Eastern shore. Crawling along the Eastern bank back to the boat launch. I also picked up a Starbucks coffee drink bottle off of the Squamish Inn/Hostel. 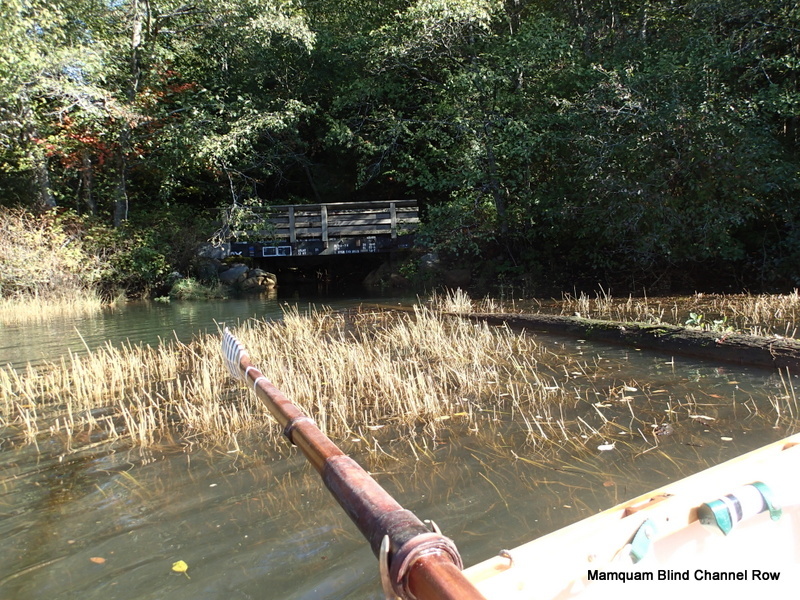 I row back to the Boat Launch, passing an awash barge near the launch. 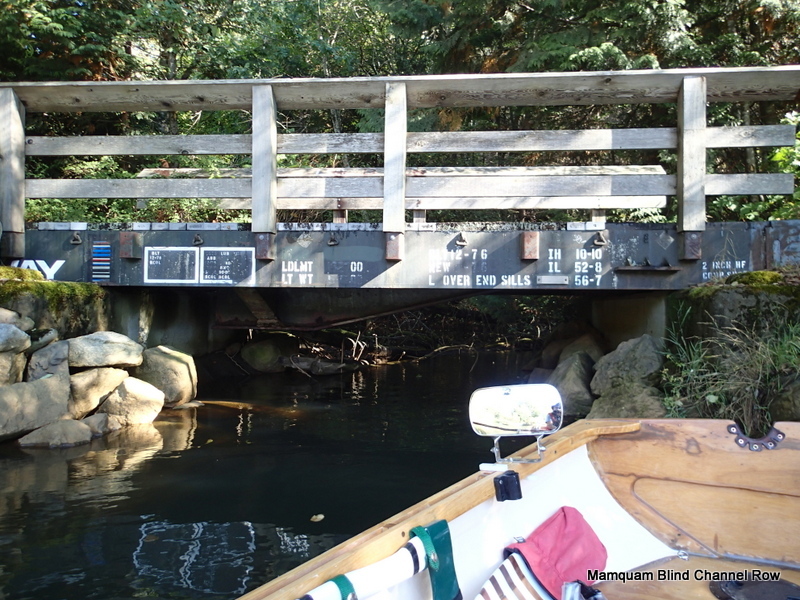 Steel barge awash next to the boat launch. I beach Gwragedd Annwn on the gravel lane of the boat launch. Gwragedd Annwn waiting for me to get her trailer. 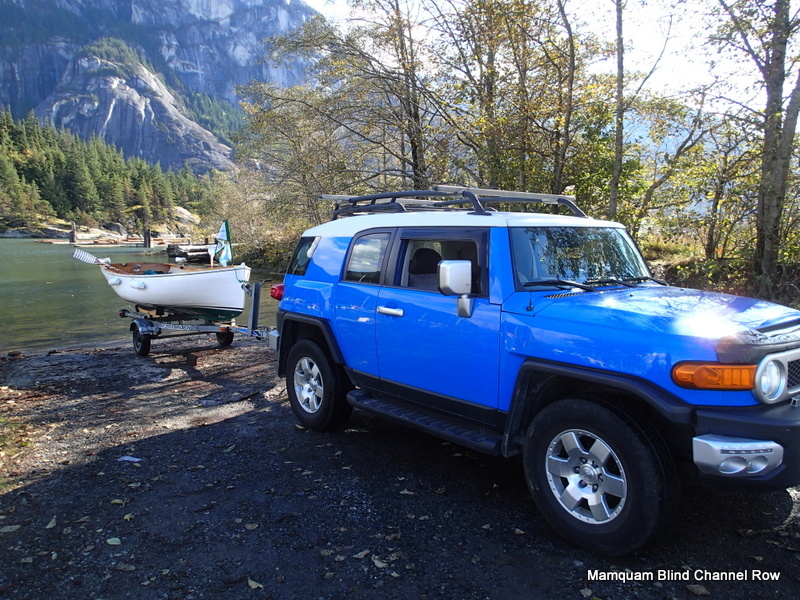 The paved side of the boat launch is being used so I put the trailer in on the gravel side. 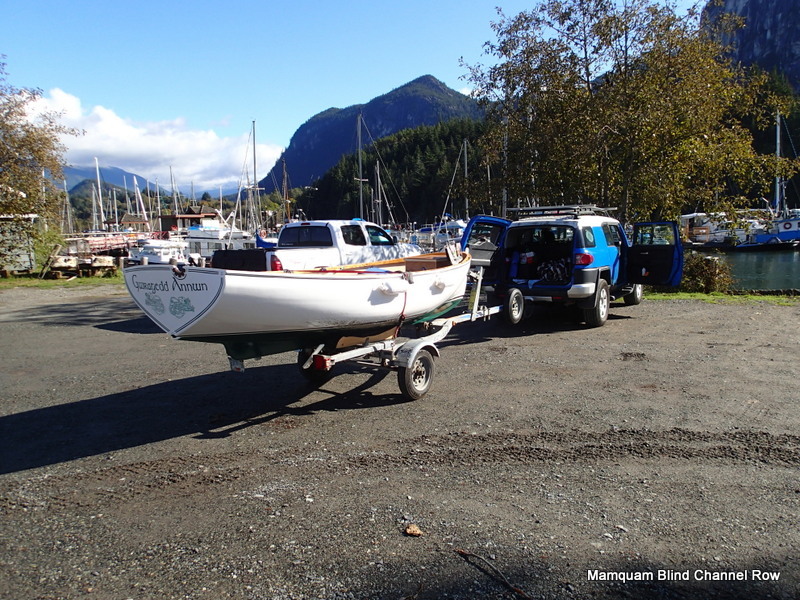 Gwragedd Annwn on her trailer, ready to be “packed-up” for the ride home. I pull off of the ramp and park over on the side to get Gwragedd Annwn ready for the trip home. Scum-line from the Channel row. Even though the Channel seemed quite clean, there is a scum-line on Gwragedd Annwn from the row. 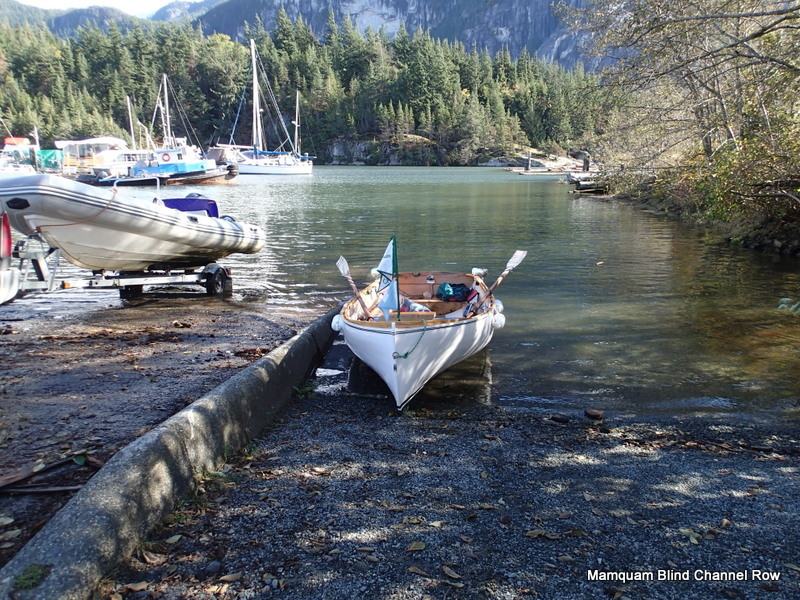 The mud on the hull is from the drive to the boat launch. Gwragedd Annwn will need a bath when we get home. All packed-up and ready to go home. See you on the next row!